Boys Town 22.2A, 1949 Boys Town Charity Seal, Type 1. The second Boys Town Christmas Seal was issued in 1949, and three types were issued, with that date. This is the very rare large snowflake variety Type 1. This seal is fresh, and bright, with sound colors, F, MNH. The seal type has a definitive line between the sky and snow. The snow flakes are large. Boy with a smaller boy on his back. "He Ain't Heavy Father He's M" Brother." 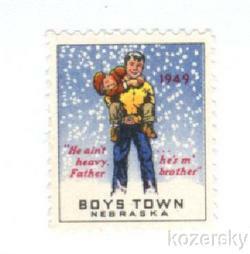 Boys Town, Nebraska, at bottom of seal. Multi-colored, seal size: 17x22, perf: 121/2.